The following series in Australia was dubbed 'the quest to regain the Ashes', and after the English won two of the three tests, a group of women from Melbourne famously provided captain Ivo Bligh with a small terracottaÂ urn, rumoured to contain the ashes of a wooden bail. This urn now sits in the museum at Lords Cricket Ground, however the legend lives on and the trophy the teams compete for is a replica of the famous vessel. The Ashes series has traditionally brought out the best cricket by both Australia and England, and in an era where Twenty20's and one-day matches have dominated the interest of cricket fans, you can always be sure to see huge crowds in attendance for the series. This highlights how history and tradition still play a vital role in modern cricket, and there is no older rivalry than the Ashes. One of the most memorable series in recent history was the 2005 edition in England. Australia travelled as undisputed world champions and were coming off an era of unprecedented dominance that included a record sixteen straight victories at the turn of the century. England were also in form leading into the tourÂ as they had gone undefeated in 2004 and risen to to second on the ICC test Championship standings. The series was described as the late and great Richie Benaud as one of the most exciting in living memory, and he would know, having been one of the most decorated cricket personalities in the history of the sport. In a five-match test tour,Â the series result is often a formality before the final test gets underway, however in this case the Ashes victor was yet to be decided when the start of the final session of the final match began. The whole tour proved to be un-missable entertainment and drama. On this occasion, England retained the Ashes with a 2-1 victory and claimed their first series win since 1989. While the celebrations lasted less than two years (the Australians claimed the next series 5-0), it will go down as easily the most memorable tour in the modern era. If the upcoming series can produce even half of the drama as the 2005 edition, we will be in for a treat! Since the epic 2005 series, the Ashes has been won by England on four occasions, while the Aussies have only experienced success twice. Remarkably though, the Australians have won more individual test matches during this time, winning twelve to England's eleven. This is mostly thanks to the 2006/07 and 2013/14 series in which Australia coasted to 5-0 Ashes whitewashes. England's last series victory over the Australians down under came in the 2010/11 season via a 3-1 result. This was the first English tour victory in Australia since 1987, and only their fifth since the Second World War. The last Ashes series was played in England in 2016 and was won 3-2 by the home side. The tour was one of the strangest in recent memory; all five matches were dominated by one team, and both sides recorded wins by more than an innings. While both teams could have won the series 5-0 with their best performances, a lack of consistency from both nations was the key conclusion from the most recent tour. The upcoming series in Australia will be the 70th in total between the two nations and incredibly, the honours are dead even in terms of series victories. Both sides have won 32 times, with five drawn series. 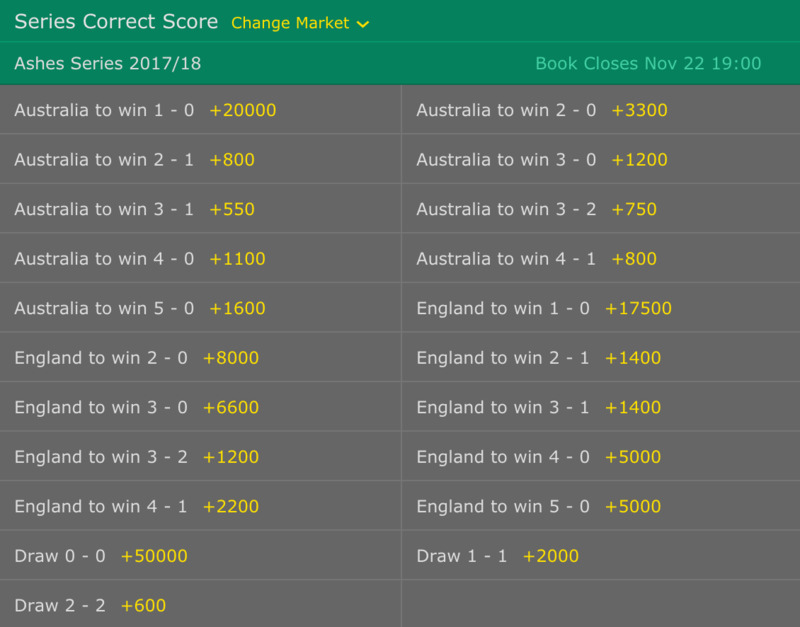 Below are the current odds available for the upcoming series, to be played in Australia commencing in Brisbane on November 23rd. Australia are the clear favourites, while England are the definite outsidersÂ according to Bet365. England's chances will rely heavily on captain Joe Root, who is up there with Smith, India's Virat Kohli and New Zealand's Kane Williamson in terms of prodigious batting ability. Root is just nine runs short of recording 1000 scored against the Australians and has scored three centuries against them, however his average of just over 41 against the Aussies is his second-worst against test-playing nations. It's crucial that he steps up a gear in this series, although he will be heavily targeted by the home side. Johnny Bairstow is also in form as we approach the Australian summer. In 2016 he scored 1470 runs, smashing the record for most runs in a calendar year by a wicketkeeper, and also broke the record for the number of dismissals with 70 recorded. He has recently risen to sixth on the ICC test batting rankings. If he can continue this form the English may cause the Australians some problems. The touring side will only need to look at South Africa's recent performance in Australia for the blueprint on how to defeat the home side. The Proteas won the 2016/17 series between the sides 2-1, including a humiliating innings defeat of the Aussies in which they bowled out the hosts for just 85. While Australia made several changes to their lineup following the second test and have performed strongly since, the result did expose their potential frailties. While Australia are nowhere near as strong as they have been in prior eras, they are a formidable opponent on their home patch and are very likely to win the upcoming series. They boast arguably the best batsman in the world in captain Steve Smith, who has already notched up twenty centuries and is averaging just over 61 at present. If he performs to his usual standard, it will be very difficult for the English to make inroads. The team also boasts some of the best fast-bowling depth in world cricket. While Nathan Lyon is likely to feature as the sole spinning option, the Australians could choose to go in with four quicks: imagine a lineup containing Mitchell Starc, James Pattinson and Pat Cummins, all bowling in excess of 90mph, alongside the unnerving consistency of Josh Hazlewood, currently ranked as the second-best bowler in test cricket. The tour starts at the 'Gabba in Brisbane, a venue where Australia have a formidable record. The home side has not lost a test match at the ground since 1988 when the West Indies toured, and England have not won in Brisbane since 1986. Any result other than a win for the Australians will be crucial to the chances of the tourists, which they proved by drawing the corresponding fixture in 2010 and going on to win the series, although expect to see the Australians win the opener. The Australians are rightly the favourites to win this series, and now that the recent pay dispute between the players and the board has been resolved, we should see a focussed home team storm to victory. Our fearless prediction is a 4-0 series victory, with a drawn match at the SCG preventing the Aussie's third 5-0 sweep in four attempts on home soil. You can also bet on the final series result, and the below table outlines the options available. 3-1 is the favoured result at +550, while our prediction of +1100 will make you some decent cash. For the England fans, the odds of a 3-2 victory are the best according to the bookmakers (+1200), however we think the 2-1 option at +1400 is a better chance. Start praying for rain though! What are your thoughts on the upcoming series? Do you agree with our prediction? Join in the conversation on our Facebook page and tell us who you think will win the upcoming Ashes series and let us know your score predictions.